What hasn't changed is our focus. Read It Later was a simple tool that focused on doing just one thing: saving things for later. Pocket is about taking all of the core parts of what people did with Read It Later and making them better, easier, and quite honestly, just a lot more fun to use. MCSTR: How was the transition from a simple tool built to "scratch your own itch" to a platform with millions of hits every month? How did you learn to "scale" the service? I think I've only seen Read It Later go down twice in the past years. In all seriousness, the single best thing I did to scale was simply to hire my friend Matt Koidin. I actually worked for Matt before he joined me at RIL. I worked as a front-end contract developer for his previous company, Team Rankings. The flexibility and stability that job gave me allowed me to moonlight RIL to a level where I could eventually make it my full time job. At Team Rankings I did front-end work and Matt did the back-end so we made a great pair. When he learned I was raising and trying to take RIL further than a solo show, it seemed like a no brainer for us to keep working together. Since Matt came on last summer he's taken almost all of the server operations away from me. He's moved everything to AWS and added redundancy to every single aspect of the service. The reason the service doesn't go down is simple: Matt does an incredible job. MCSTR: Interesting. How does the launch of a new iPhone or iPad typically affect RIL's traffic and downloads? NW: If you look at a graph of our daily downloads over time, you'll see all of these little ledges. Each time a new device is released we'll have a spike and then they'll settle a little bit higher than they were before. The size of the bump really depends on the device though. For example, the iPhone 4S launch gave us a nice spike on launch day but it settled fairly quickly. Compare that to the iPad 3 where since its launch, our downloads have been up 35%. The Retina screen on an iPad just makes an app like ours so much better. MCSTR: I can imagine how the iPad's Retina display can make for a fantastic reading experience. But Pocket is more than that, right? It's pictures, videos, and webpages that aren't necessarily articles. How does Pocket leverage this ecosystem of mobile devices to offer a better "save for later" experience? NW: Most people need to be able to save more than just articles. Over 40% of the stuff that gets saved to Pocket are things like videos, recipes, pictures, and webpages. Even if all you ever save is articles, those articles often have big beautiful images or embedded video. Those pieces are just important to telling the story as the words themselves. It's important in a 'save for later' experience that you are able to save anything. I think it's interesting that you call out the iPad for just reading. Personally, I do most of my reading on my phone because it's a great form factor and easy to hold in one hand when I'm crammed into the subway on the way to work. But when it comes to watching videos, nothing beats plopping down on the couch at home and watching them on an iPad or Air-Playing them to my TV. Recognizing how these contents work together with a specific device is an important part of what we focus on. We display each item in a view that works best for the type of content and for the screen the user is on. We display articles in a our Article View, videos in a clean video player, and webpages just as they would normally appear in your browser. Each view is tailored to the device and screen size. MCSTR: And have you ever been approached by publishers about possible partnerships? Because I take a look at what "social readers" like Flipboard and Zite are doing, and I wonder if it might be cool exploring a system where a website can "optimize" a site for Pocket, offering a custom view for their articles. NW: Actually, we've been working pretty closely with a number of publishers. Outside of the work we've been doing on the new Pocket update, some of most exciting work is in the experiments we've been planning/building with the more forward-looking publishers that we've talked to. The publishing/content world is changing and it is clear that a lot of publishers are starting to take notice. It's really important to us to build something that helps publishers continue to create quality content and serve their audiences. MCSTR: When did you realize this couldn't be a major Read It Later update, but needed to become something more -- the Pocket we have today? NW: It was almost a year to the date. We had been planning to rebrand since last Summer. The original plan was to roll out Read It Later 3.0 and then follow up with the rebrand shortly after. There had not been a major update to the app in a long time due to the months I had spent growing the company from one to many (a whole different topic). As a result, we were feeling a lot of pressure to get something out the door quickly. Early this year we made the incredibly hard call to delay the release even further so we could include Pocket. It was just too important to leave it out. It helped tell our story and it sends a strong message on how we see this space. It was a really hard decision because we had been working so hard since the fall and just wanted everyone to see the product but in the end I couldn't be happier. We made the right call. We didn't sacrifice quality for speed. The only mistake we made was pre-announcing before the product was finished. MCSTR: And I believe that hard decision is the reason why today's Pocket is such a great product. So do you think Pocket could be the first service to really "mainstream" the save-for-later concept? There are bookmarking services, Evernote, competitors, and even Apple is doing some basic stuff with Reading List and iCloud. What is, in your opinion, the real differentiator of Pocket? NW: Absolutely yes -- our hope is that Pocket will take 'save-for-later' to the mainstream. The problem that people face today is that there are a thousand places to discover content and a multitude of devices to consume it with. Our key differentiator is in our thinking and approach to this problem. A 'save for later' service has to have ubiquity. It has to be available on every platform and supportive of all types of content. The world is visual and about more than just text. What Pocket has finally solved is finding a way to be all encompassing while still keeping it beautifully simple. MCSTR: What are your thoughts on parsing content from websites -- offering optimized views for articles, etc. -- vs. still offering easy ways to get to a publisher's website and original URLs? NW: We make it easy to get to the original article. Toggling between the Article View and web view takes a single tap. MCSTR: ﻿How do you see this new trend of building applications and services that "understand" the content from the web we like and might be interested in? I see these apps, like Zite and Flipboard with its Cover Stories, that are experimenting with all these algorithms and systems to analyze user behaviors and pipe selected content through data points. Have you guys ever thought on building these algorithms yourselves, or do you prefer leveraging other platforms as ways to get content into Pocket? NW: The Zite guys do an awesome job with this. You can connect your Pocket account to Zite and they'll look at the articles you've saved and figure out what topics to show you. If you've been using Pocket for a while, the categories they pick for you feel a little bit like some crazy voodoo magic. We have a lot of interesting data to play with there. A lot of those services like Zite require you to constantly be liking or disliking content so that you can teach the system what you want. With Pocket, you're effectively doing the same thing but without having to be mindful of taking that additional action. Things you saved were interesting to you, things that you read captured your attention and things that you favorited you loved. This is a place we've been thinking a lot about. However, we're not looking at it in terms of discovery. There are plenty of apps that nail that (like Zite and Flipboard). What we'd love to be able to do is if an item has a hundred items saved but only 20 minutes of free time, tell them what content they should view first. That's where it will start to get really interesting. MCSTR: Where does Pocket see the most content coming from? Is it the bookmarklet, browser extensions, email, or connected apps? NW: Browser saves (extensions and bookmarklets) make up about 50% and third party apps make up about 40%. The fastest growing source of saves are Twitter apps and social news apps like Flipboard and Pulse. This will be the year that mobile saves pass desktop saves. MCSTR: You decided to release Pocket on a variety of platforms and devices to make it as ubiquitous as possible. How would you compare iOS development to Android? MCSTR: Eh, pretty self explanatory. Was developing for the Kindle Fire much different than "regular" Android? NW: The development process was the same. Design however, required a lot more thought. 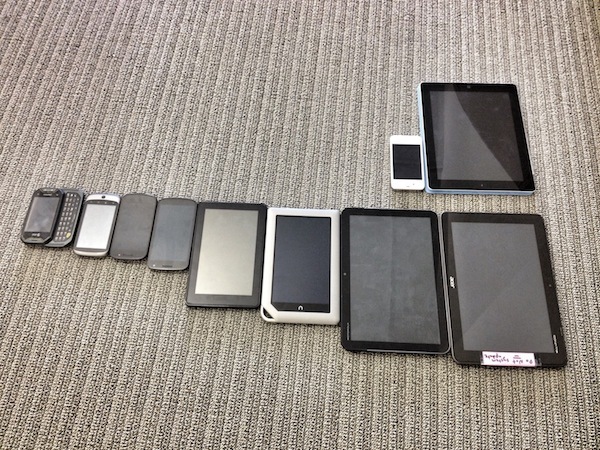 When we did our initial wire-framing we started with two base designs: phone and tablet. Once these designs made it into build and we started using it on an actual Fire it immediately felt wrong. The Fire's smaller form factor and narrow screen proportion is pretty unique compared to the other devices we've been working on. In the end we decided to add a third design category for 'small tablets' like the Fire. MCSTR: Are you seeing people reading more on tablets, less on phones, or perhaps consuming a lot of video on both -- how are people using Pocket? NW: I haven't looked at the impact of the increasing popularity of tablets on the usage of phones. That would be an interesting case to look at. However, I did research something similar regarding the impact of iPads on computer usage. It showed a dramatic decrease in reading on a computer once someone became an iPad owner. From what I have seen of phone usage inside Pocket is that it is more about filling up whitespace time (commuting, waiting in line, etc) whereas iPads are more about consuming during down time. I'd imagine them to compliment each other, not compete for time. MCSTR: After today's launch, what's next for Pocket? NW: To me, this launch isn't about a product update or new features. It's about the platform that we've built and what we're going to be able to do with it. The rewritten platform allows us to iterate and move faster than ever before. We have a lot that we want to do and today we get to start building it. Check out our review of Pocket here.